Color refers to the natural body color of a diamond and not to the reflection of spectral colors that flash when a diamond moves. Most diamonds naturally exhibit slight hints of yellow, brown, or gray. This color is caused by natural trace elements of nitrogen that were present when the diamond formed under the Earth's crust. The less color a diamond exhibits, the higher the rarity, and therefore the higher the value. Diamonds with less color allow more light to pass, releasing more brilliance and fire. A diamond acts as a prism by dividing light into a spectrum of colors and reflecting this light as colorful flashes called dispersion or fire. Similar to looking through colored glass, color in a diamond will diminish the spectrum of color, or fire, emitted by acting as a filter. A diamond with a higher color grade, i.e., one with less color, demonstrates more colorful fire. D-F diamonds should only be set in white gold / platinum. Yellow gold reflects color, negating the diamond's colorless effect. For colorless diamonds the differences between D to G are barely visible but can offer 20 to 40% better value. D is generally more for the investor or diamond connoisseur. H graded diamonds are often considered on the border between premium colorless and tinted diamonds, and therefore offer great value without any visible yellow or brown tint unless compared side by side with a whiter diamond. I and J colors will generally face up white from the top, but you will be able to detect slight yellow or brown tints when viewed from multiple angles. We highly recommend staying with GIA only for these color grades, as any other certificate in this range is likely to fall below your color expectations. K and L are acceptable on a GIA certificate in terms of tint if that major compromise is needed to reach size within a budget. We strongly recommend setting these diamonds in Yellow or Rose Gold jewellery to make the diamond appear less tinted. Completely colorless diamonds (such as D and E) are much rarer than others which is why they come with a higher pricing premium. The key question is always where to draw the line when choosing the color of a diamond - how far can you compromise color before the diamond is too tinted? The answer to this question is relative to your budget and quality expectations. D is the highest color grade attributed to a diamond, denoting that the stone is completely colorless (white); as such, they are extremely rare and command the highest prices. The color difference between a D and an E graded stone is usually only visible to an expert gemmologist using master stones as a comparison, although E graded stones are slightly cheaper. The color difference between an E and an F is only visible to an expert gemmologist using master stones as a comparison. F grades are the lowest and therefore least expensive of the premium colors. G graded diamonds are nearly colorless and a slight color difference only become perceptible when compared to diamonds of grades D or E. G stones appear colorless especially once set and therefore offer excellent value for money. H colored diamonds are near colorless diamonds which still appear totally white or colorless if they are not compared side by side with higher color graded stones. The H color is generally considered the watershed between colorless diamonds and slightly tinted diamonds. I colored diamonds are very slightly tinted diamonds, however, once set in jewellery, these stones may appear colorless. If you are looking to maximize your budget, then an I colored diamond offers great value for money. J colored diamonds are very slightly tinted diamonds, however, once set in jewellery, especially in yellow gold, it is harder to see the slight yellow tint which the J grade produces. K colored diamonds are slightly tinted diamonds, however, once set in jewellery, especially in yellow gold, it is harder to see the slight yellow tint which the K grade produces. Some reputable jewellers currently offer only stones in the higher range of D-J, as these are the only grades we recommend, however, lower clarity grades can be made available on special request. 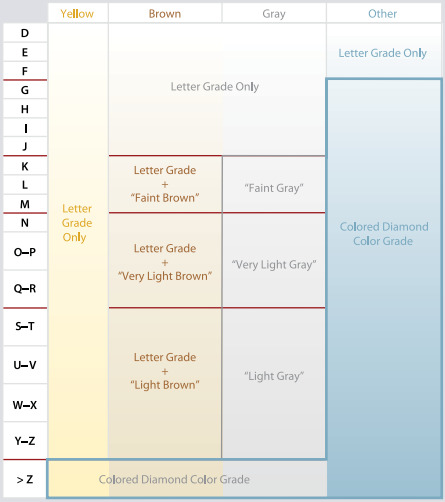 The picture below shows an approximate guide to a master set used by gemologists to grade color in diamonds. Each diamond to be graded is compared to the master set to determine where it should fall on the diamond color scale. The colors you see below are slightly exaggerated, since viewing diamonds face down makes their body color more pronounced. The face down orientation makes the detection of body color easier because brightness and fire are minimized when the diamond is face down. Color becomes much harder to detect once a stone is set in a ring and placed in an environment that contains color (as opposed to the all white background used in diamond color grading). For instance, an H color diamond may look as colorless as a D when set in a ring under normal lighting conditions, especially if the two are not compared side by side. Another factor that affects a diamonds's apparent color is the color of the mounting itself. Yellow gold makes slight amounts of yellow in a diamond less obvious, while white metal mountings make the color in yellow diamonds more apparent. The vast majority of untrained observers (and many gemologists) cannot distinguish a color grade from the one just above or below unless the diamonds are compared side by side in a controlled environment. While "colorless" diamonds are the most popular, they are just one category of diamonds. The other category of natural stones is known as "fancy color diamonds." Although relatively rare, they have been found in every color of the spectrum. Some of the most famous fancy color diamonds include The Hope Diamond (a walnut-sized blue diamond), the Hancock Red (which sold for $926,000 per carat at a 1987 auction), and the Dresden Green (the largest green diamond ever found). Fancy color diamonds are not graded on the same color scale as "colorless" or "white" diamonds. Rather, their value is derived by color intensity that ranges from Light at the lower end to Vivid at the high end. The more intense or strong the color appears, the more valuable the diamond. 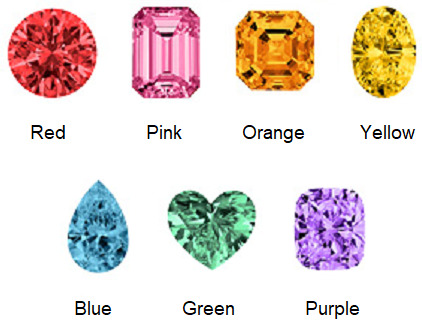 Color intensity is the most important factor when purchasing a fancy color diamond. The distinct difference between fancy color diamonds and other colorful gemstones such as rubies, sapphires, and emeralds is in the mineral makeup. In particular, it's the presence of carbon that differentiates fancy color diamonds from other colored gemstones. All natural color diamonds are graded by gemological laboratories under controlled lighting environments similar to that of natural daylight. Diamonds are also tested for treatment, synthetic additions or alterations to ensure their authenticity.